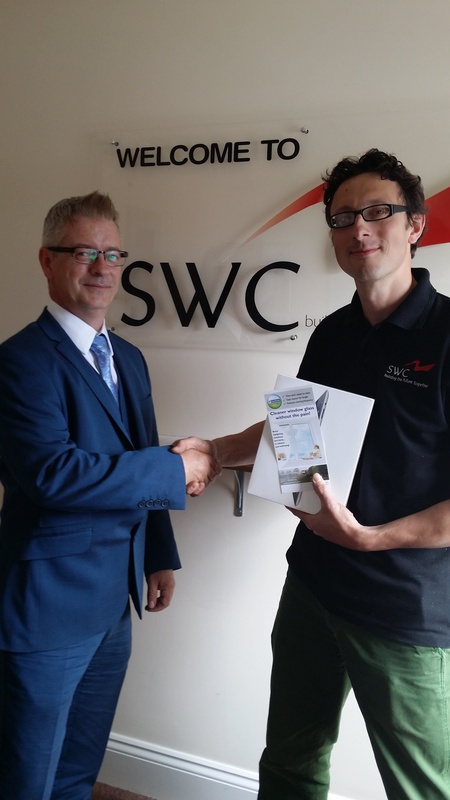 Congratulations to Mike Hewison of SWC Scarborough who won our FIT Show iPad Competition. Brian McDonald, Sales and Business Development Manager for Ritec International is seen here presenting the prize to a very happy Mike. 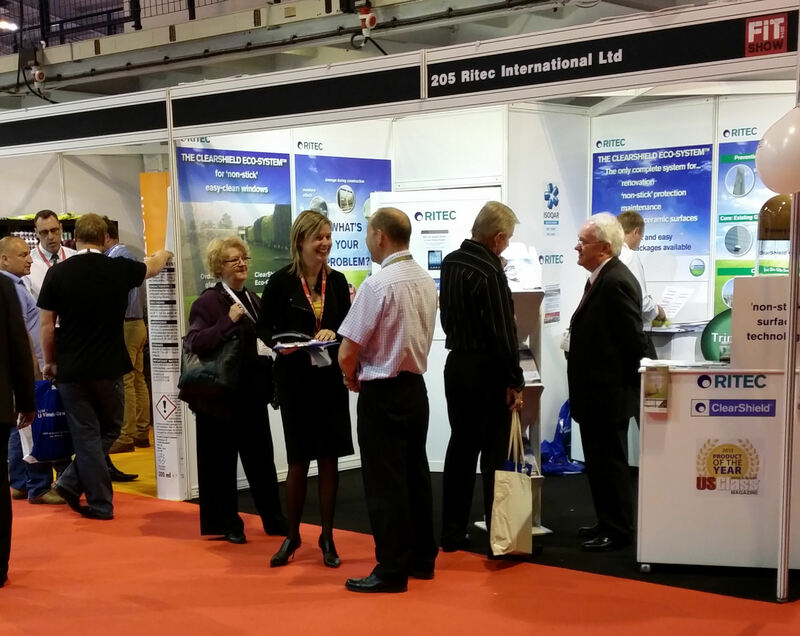 Just a few weeks after the trade event of the year for glass fabricators and installers, Ritec continue to report positive feedback, new leads and early business opportunities as a result of their presence at the FIT Show. Enjoying a busy three day event, Ritec demonstrated how the new ClearShield Eco-System™ gives glass fabricators and installers the competitive edge. Ritec demonstrated the first and only glazing component with a three-way guarantee covering performance, added value and profit at every step of the supply chain – Specifier, glass processor, fabricator, installer/dealer and end user. Visitors were shown how the ClearShield Eco-System™ transforms new or old glass into a higher value product with low-maintenance performance, resulting in diversification leading to higher sales. Furthermore, the ClearShield Eco-System™ helps maintain the original ‘A’ Window Energy Rating (WER), allowing glass to uphold its optical clarity and light transmission over the life of the window. Ritec also showcased their new ‘One Stop Shop’ for surface renovation, protection and maintenance that offers customers solutions specifically tailored to their needs. It utilises Ritec’s total systems including the award-winning new ClearShield Eco-System™ for glass and the Ritecoat System™ for metal and painted surfaces. In addition, Ritec’s expertise allows the company to continually develop and improve technologies for the renovation, protection and maintenance of a wide range of surfaces in and around the home. Glass is a vital part of building design because it allows direct transmittance of natural light. 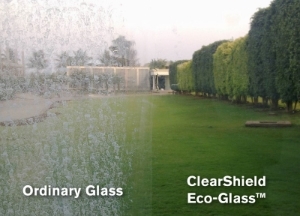 Dirty glass increases energy requirements and operating costs of buildings. It also reduces ‘daylighting’, which affects the wellbeing and productivity of building occupants. It is therefore crucial to keep glass looking and performing like new for longer – with its original visibility, clarity and cleanliness. Ordinary, unprotected glass is a high maintenance construction material that will suffer from damage by dirt during handling, storage, transport, installation and use. For both architectural and solar panel glass, reduced frequency and ease of cleaning is essential. The simplest and most cost-effective solution is prevention – applying a surface treatment when the glass is new and pure that is durable and ‘non-stick’ or non-reactive. ClearShield® provides that solution. Glasstec, the world’s largest and most international trade fair for the glass industry, is back later this year. And that can only mean one thing; Ritec’s Hotelship, the Da Vinci, is back as well! The hotelship will be moored in the centre of Düsseldorf close to Altstadt (Old town) from Monday 20th to Friday 24th October, with free coaches in the mornings to take you directly to the show. 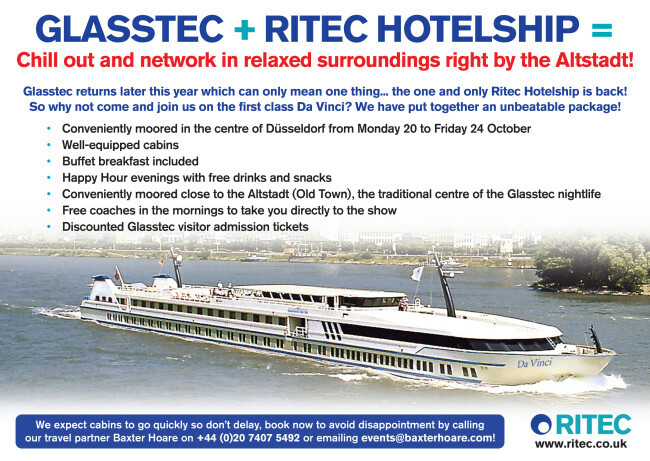 The hotelship package also offers discounted Glasstec visitor admission tickets, yet another reason to join Ritec on the first class Da Vinci!